I Cracked a Tooth! How can my Dentist in Bixby Help Me? So you’ve taken a hard fall on the concrete or chipped your tooth on a hard piece of candy (we warned you about those!). Whatever the case may be, you’re facing a dental emergency: your tooth is chipped and cracked. What do you do? Moreover, how can your dentist in Bixby help you restore your smile? At Complete Cosmetic Dentistry, we’re equipped with two expert dentists, Dr. Mohanna and Dr. Georgy, along with our friendly office team to handle any dental emergency—especially chipped or cracked teeth. Our dentists know there are various types of dental injuries and different ways to treat them, specifically with cracked or chipped teeth. Not all dental injuries require the same remedies. It’s important for you to be able to recognize these differences as well. These are minute cracks on the outside of your teeth that only affect the outer layer of your tooth (enamel). When a piece of your tooth’s chewing surface breaks off. It’s not usually too painful. When the crack extends from the chewing surface of your tooth down toward the root. If you don’t treat it in the appropriate time frame, it could get much worse and even result in tooth loss. 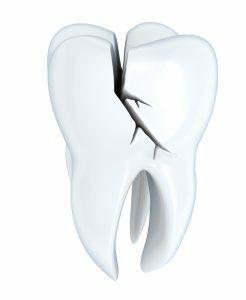 If a tooth has become split, it’s usually because it was originally cracked and didn’t receive the appropriate dental care. After being neglected, you can identify two split segments. When a crack starts in the root of the tooth and extends to the chewing surface. These types of cracked teeth hardly show symptoms until the surrounding jawbone and soft tissue become infected. Here are some of the dental procedures we offer at Complete Cosmetic Care Dentistry. Your cosmetic dentist in Bixby will determine which of the following treatments are best for you and your lifestyle. Veneers are covers for a tooth created of tooth-like, durable dental porcelain. The veneer is bonded to the front of your tooth, transforming your smile’s appearance. This is a great replacement option if you have minor cracks like craze lines that are noticeable when your smile. If your tooth is cracked and you’re now experiencing pain when you chew, drink, speak, or eat, either of dentists could recommend a dental crown. A dental crown caps the affected tooth with tooth-colored porcelain. This will give your smile newfound stability and an improved appearance. If the crack in your tooth has extended to the root of your tooth, you can get a root canal to treat it. A root canal will remove any dental debris and bacteria from inside the tooth and seal it with a sturdy same-day dental crown. If the crack in your tooth exceeds even lower than your gum line, your tooth is unfortunately no longer treatable. At this point, your tooth is past the point of restoration. Instead, you will need to consider tooth replacement options. Dental implants are the best way to replace your natural teeth because they mimic your tooth from root to crown with three biocompatible pieces: titanium implant posts, abutments, and the dental prosthetic of your choice. Contact Complete Cosmetic Care Dentistry ASAP! Again, the most important part of managing a dental emergency is to remain calm until you can visit our dental office. If you are faced with a cracked tooth, it can be scary! But do not delay giving us a call! Our dental professionals will do everything in our power to relieve your pain and restore your smile with long-lasting cosmetic solutions. Comments Off on I Cracked a Tooth! How can my Dentist in Bixby Help Me?